Out riding on Friday, I went under this bridge. It's at the north edge of Leschi Park, and doesn't seem to make any sense. 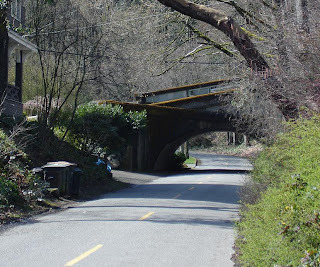 It's a 5% grade, too steep for heavy rail or streetcars, and is presently unused, just a grassy right-of-way running up the hill on Google maps. Further research shows that it was the grade for of the Yesler Way cable car line, running down to what was a ferry terminal for traffic across Lake Washington. The third picture of this Cable Car Museum article is the best view I could find. The ferry landing is shown in this Pacific Northwest article.